(2017). Synthesis and characterization of optically active polyester thin-film bionanocomposite membrane achieved by functionalized cellulose /silica for gas permeation. International Journal of Bio-Inorganic Hybrid Nanomaterials, 6(3), 113-129.
. "Synthesis and characterization of optically active polyester thin-film bionanocomposite membrane achieved by functionalized cellulose /silica for gas permeation". International Journal of Bio-Inorganic Hybrid Nanomaterials, 6, 3, 2017, 113-129. (2017). 'Synthesis and characterization of optically active polyester thin-film bionanocomposite membrane achieved by functionalized cellulose /silica for gas permeation', International Journal of Bio-Inorganic Hybrid Nanomaterials, 6(3), pp. 113-129. Synthesis and characterization of optically active polyester thin-film bionanocomposite membrane achieved by functionalized cellulose /silica for gas permeation. 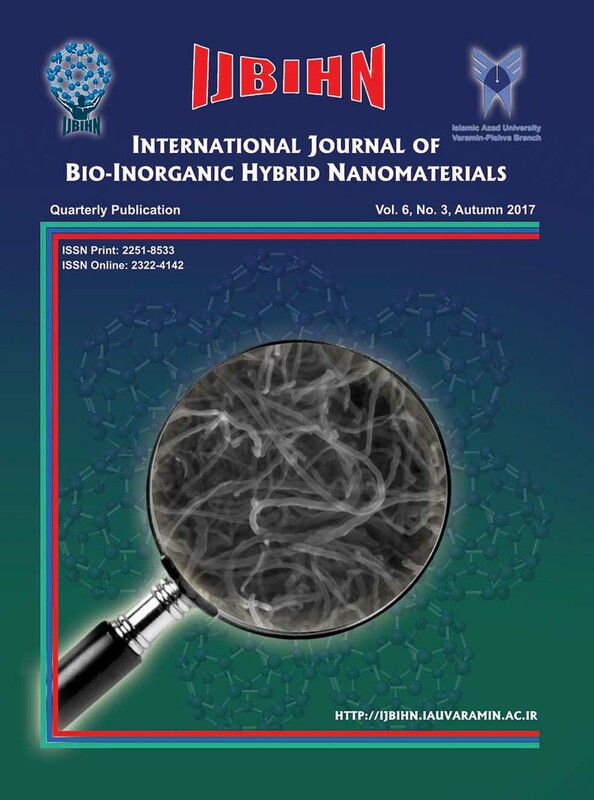 International Journal of Bio-Inorganic Hybrid Nanomaterials, 2017; 6(3): 113-129. Optically active bionanocomposite membranes composed of polyester(PE) and cellulose /silica bionanocomposite (BNCs) are a novel method to enhance gas separation performance. Commercially available silica nanoparticles were modified with biodegradable nanocellulose through ultrasonic irradiation technique. Transmission electron microscopy (TEM) analyses showed that the cellulose/silica composites were well dispersed in the polymer matrix on a nanometer scale.The tensile stress–strain of the hybrids was investigated, and the resulting nanocomposites showed good mechanical properties.Thermo gravimetric analysis (TGA) data indicated an increase thermal stability of the PE/BNCs in comparison with the pure polymer. The permeability and selectivity of the PE/BNCs membranes as a function of the BNCs weight percentage were studied and the results obtained from gas permeation experiments showed that adding BNCs to the PE membrane structure increased the permeability of the membranes. Increasing the cellulose/silica mass fraction in the membrane increased the diffusion coeffificients of gases considered in the current study. Further, antimicrobial test against pathogenic bacteria was carried out.